In an interview with TVA Sports, WWE RAW Superstar Sami Zayn opened up on a myriad of topics. Most prominently, Zayn confirmed the fact that he did go off-script on the RAW after WrestleMania 35. Additionally, Zayn asserted that former WWE writer Robert Evans helped him with the new heel character. Sami Zayn, whose real name is Rami Sebei, has competed in the sport of professional wrestling since 2002, and joined the ranks of the WWE in 2013. Zayn performed on NXT and eventually made his mark on the WWE's main roster shows as well -- impressing fans and experts alike, so much so, that he has often been hailed as one of the greatest in-ring performers of this generation. Zayn had to step away from in-ring competition in July of 2018, owing to shoulder injury issues -- Following which, he underwent double shoulder surgery, and finally made his on-screen comeback to WWE on last week's episode of Monday Night RAW i.e., the "RAW after 'Mania". Sami Zayn is now seemingly shedding light on the fact that he still isn't where he wants to be, as regards his physical fitness. Zayn insinuated that although he underwent double shoulder surgery and a considerable amount of rehabilitation, his arms and shoulders still aren't back to 100 percent. "I feel my shoulders and arms heavier than usual...Even after nine months, I'm not exactly where I would like to be. But just before these recent episodes of inflammation, I felt the best shape I had been in a long time." Furthermore, Zayn elucidated that his time away from the ring, gave him the opportunity to examine a few bad habits and mistakes he'd been making with regard to his on-screen performances in WWE. Zayn added that he pitched a few ideas to the WWE, one of which made it a step further in the approval process, only to be rejected in the end. He continued that ex-WWE writer Robert Evans (the writer who parted ways with WWE during the 2019 Hall Of Fame induction ceremony), who is a good friend of Zayn's, helped the latter develop his new heel character. The Underdog from the Underground explained that Evans suggested that the former could become a critic of the most passionate fans. Zayn then channeled all his anger stemming from his own bad habits and mistakes, and directed it toward the WWE Universe -- blaming the fans for his own fallacies. Moreover, Zayn confirmed that he did write his own promo for the RAW after 'Mania -- adding that he sat down with an agent, came up with the promo, which eventually received approval from the WWE Creative Team. 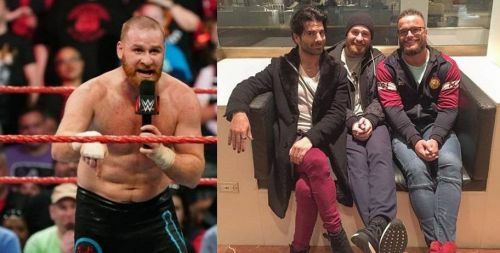 Sami Zayn also highlighted the fact that the WWE offered to have him make a comeback at the 2019 Royal Rumble in January of this year, however, he wasn't fit enough to stage a return that soon. Zayn also pointed out that although there were rumors of him returning on tonight's RAW, from Montreal, the company chose to have him make his comeback on the RAW after 'Mania. He also emphasized how he was first being brought in only for a promo, which then was said to be a backstage segment. However, he eventually ended up competing against and losing to Finn Balor in an Intercontinental Championship match, and then delivering a scathing heel promo against the WWE Universe. What are your thoughts on Sami Zayn's new heel character? Sound off in the comments!